I gave a go on Enlightenment DR17 lately. Got pros & cons, but on the Look side it's a winner. 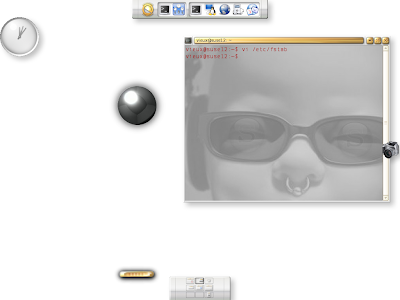 This is running on openSuSE10.2, using the .rpm package available on the GURU repositories, buid date is 01/01/2007. Not flawless, it's PITA to start, especially if youy want your Flashdrives to show up. 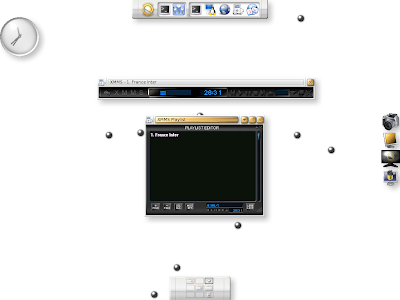 No Scanning & Printing tested yet, just fooled around with these screenshots listening to a webradio, watched a DVD in Borderless mode, fiddled whith this & taht, you see. Pottering around. 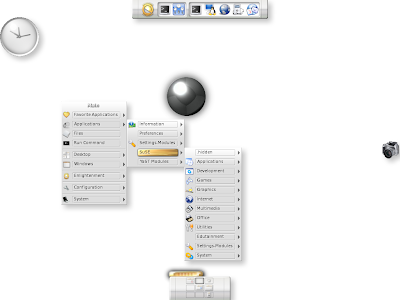 The image above are some shots of my usual 9 virtual desktop setup. You'll recognize the Baby from previous deskshots, this time inside a gnome-terminal without Toolbar & borderless. And, these backgrounds: yes, moving, animated ones. Funny, an not that ressource-inetnsive (these one at least, more heavy ones do not run that smoothly on this ol' 1.6 box). Easiyer to handle than DR16 actually, more feature-packed (so, more confusing at first), it missed the straightforward, sleek & fast look & feel of DR16. My 10-years old daughter favour it, though, as there is proper menu lauch and these so funny backgrounds.